Manitoba MLAs toured the city’s downtown in a way they likely have never done before on Monday. 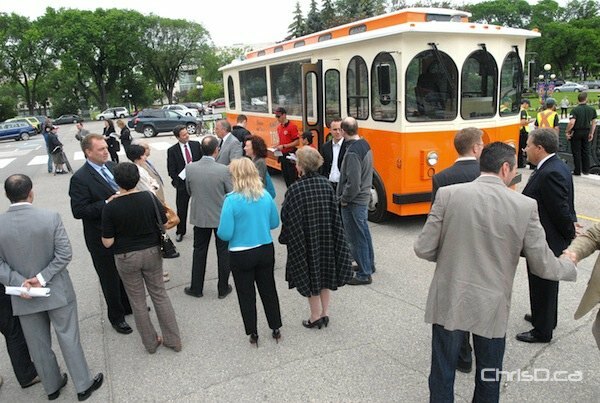 The Downtown Winnipeg BIZ took government members on a trolley tour to show off the inner-workings of the city centre and the Downtown BIZ this morning. Following the tour, MLAs and ministers participated in an open discussion with members of the Downtown BIZ board to talk about downtown and the role of the BIZ. The first pitstop was at the Manitoba legislature at 11:30 a.m. The roughly one-hour tour wrapped up at MTS Centre.